Fabric & Yarn , originally uploaded by lyndsey-jane. 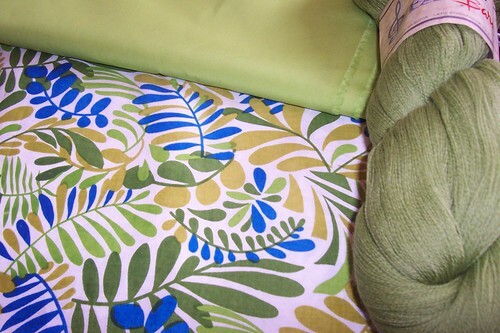 I finally have the fabric and yarn for my outfit for mum’s wedding, all I have to do know is make it. The printed fabric will be used for the dress and exterior of the handbag, with a small amount of the contrasting plain fabric used on the dress and for the lining of the bag. The yarn (which is Baruffa Cashwool) is due to become Honeybee stole. The colours are more vibrant in real life, except the turquoise which seems much brighter in the photo. I seen the most gorgeous pair of shoes that would go brilliantly with this outfit but am unsure if I can justify the price – for those interested they are Imelda in lime and can be found here. I have also bought the same printed fabric in the purple colourway which I plan to make a skirt with, pictures on flickr. we are off to stay with Karl’s parents until the New Year. I hop everyone had a great christmas and all the best for the new year.